Please register with link on the right. Summer classes for children and youth to learn Quran recitation, improve fluency & Tajweed and memorize various Surahs. Please register from link on the right. A gathering for our teenage (13+) youngsters in a casual but productive setting to learn from them how to better serve the youth in our community. Please RSVP through the link on the right. Please click the link to download a LIC waiver form. Please click the link below to download a PDF copy of our Bylaws. The Louisville Islamic Center was constructed in 1980 on River Road in Louisville, Kentucky. Although the Mosque has gone through some changes and different names, it is still providing Islamic services to the Greater Louisville community. The structure, facing the grand Ohio River, has architecture that is quite utilitarian, painted in a white representing simplicity and purity, with traditional influences highlighted in green(a color chosen more as a harkening to tradition rather than rooted in faith). Prior to the establishment of the Mosque, Muslims used to gather in local homes or commute to other areas for Friday prayers. Now, the Louisville Islamic Center is one of over 12 different Mosques in our city. The Louisville Islamic Center is open to all, regardless of ethnicity or faith. Our community members represent over 75 different nationalities and many different professions. We regularly host tours and open workshops for those who are interested in learning about Islam. If you would like to visit, register under the 'Programs' section below! Imam Mohammed Wasif Iqbal grew up in Baltimore, MD and started studying the Quran at a very young age. He was able to memorize the entire Quran by the age of 13. Imam Wasif continued his studies at Darul Uloom Al Madania in Buffalo, NY. After eight years, he received Ijaazaat in various Islamic Sciences(including Arabic, Fiqh [Jurisprudence], Hadith, Tafseer, Tajweed, and Qira’ah). Imam Wasif graduated in 2008 with a Masters in Islamic Studies and has been serving as the Imam at the Louisville Islamic Center ever since. Imam Wasif lives in the greater Louisville area with his wife, daughter, and son. To provide a quality Quranic, Arabic, and Islamic education. Our vision is to provide a professional, high-quality, and stimulating Islamic environment where students are able to recognize and achieve their highest potential. When the semester is in session, classes are held on Sundays from 11:00 AM to 2:00 PM. Students will receive quality education that will benefit them, and those around them. A Connection to the Masjid: Giving children the opportunity to interact, learn, and worship with peers at the masjid in an Islamic environment. Not only will students learn about the deen, but they will also establish a strong connection to the masjid that will, inshaAllah, transpire when they are the adults and leaders of the Muslim community. A Quality Education: We provide students with a quality, comprehensive Islamic education covering Quran, Arabic, and Islamic studies. High Expectations: We hold students and teachers at a high level so that students successfully learn and apply the outlined curriculum for the year. Accountability: We establish clear goals with respect to curriculum and expectations of our students and teachers. We evaluate and measure our progress and hold ourselves accountable for results. We teach students to become self-motivated and responsible. The Desire to Learn: We instill the love of Islam and the Sunnah into our students, so upon graduating from the Weekend School, students wish to seek Islamic knowledge on their own accord. Collaboration: A child’s success in the RRM Weekend School depends on teachers, staff, parents, and students staying connected and working together as partners for the benefit of the students’ education. Diversity: We value diversity and wish to teach our students in a way that will help each child develop concepts, disciplines, and principles relative to their unique Islamic identity. The Louisville Islamic Center (LIC) Weekend School is a weekend school that admits students aged 5 – 18. Children of any ethnicity or faith are welcome to attend. 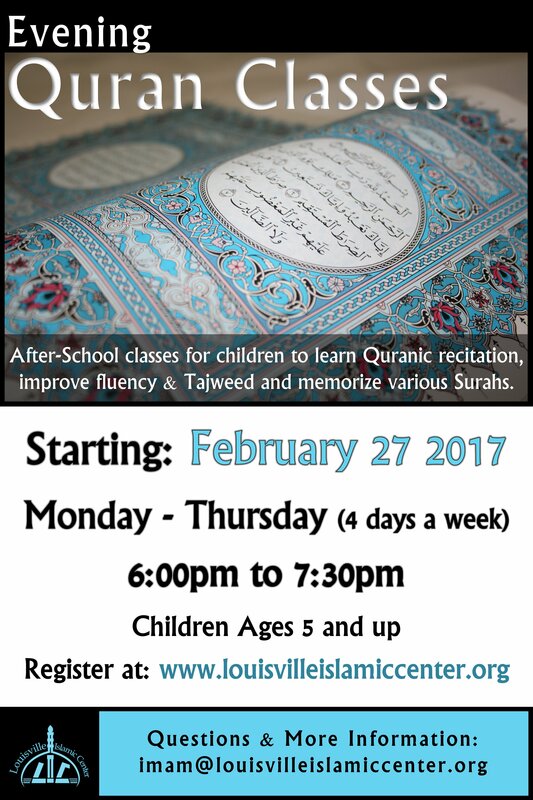 If you would like more information, please contact the Weekend School Coordinator, Nasrin Dugla, at WS@LouisvilleIslamicCenter.org. She will be able to inform you of the next open house, or she can be available for a meeting. Families wishing to enroll their children in the school program shall be required to make a one-time tuition payment of $135/semester per student. This total consists of a semester registration fee of $10 and then the enrollment fee of $125. The payment can be split up into five monthly payments of $27 per student. We understand that education is very important, as such, we are willing to work with families under who cannot take on the burden of this cost. Families should not hesitate to contact the Weekend School Coordinator if there is a need for assistance. Books must be purchased from the Weekend School and have various prices based upon the Class Level of your child. The Louisville Islamic Center (LIC) Weekend School abides by State and Federal laws and regulations associated with hiring and student enrollment. It commits to the nondiscrimination of students in its educational programs, activities, and volunteer services for all students, parents, faculty, and volunteers. The LIC Weekend School does NOT discriminate in enrolling students or hiring employees based on race, age, physical or mental disability, marital status, gender, religion, ethnicity, pregnancy, or any medical condition. Schedule a visit, sign up for the Weekend School, or register for one of the various programs. What happens at our Mosque? We host all 5 daily Prayers with a Sermon on Fridays at 2:00 PM for the Jummah Prayer. We have a Weekend School open to all from the ages of 4 to 18. We offer tours of the Mosque and invite guests to sit in on Friday Prayers. We are regularly involved in different interfaith activities and various service projects. We offer education on Islam to anyone who seeks the knowledge. We host picnics, community events, and educational camps. 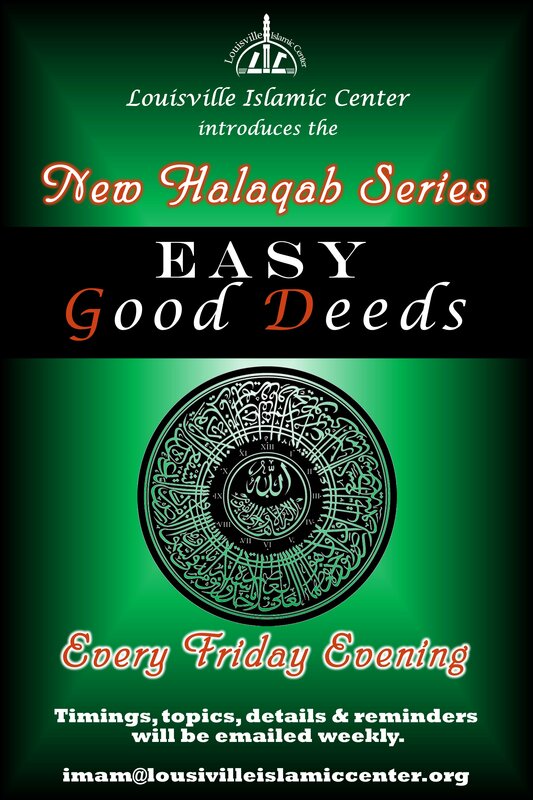 We have a Halaqa led by Imam Wasif most Friday evenings. We also offer a spectrum of services for the Muslim Community, like those for marraige, divorce, funerals, financial assistance to the needy, etc. Sign up for any of our programs below! We are happy to hear that you're interested in visiting our Center! Guests visit our Mosque fairly often and we always try our best to keep them engaged during their visits. We continually have many different sorts of visitors, from single individuals, to large faith-based groups and school groups. You don't need to be with a school or a specific group to visit the Center, though, any individual is welcome! If you request, our Imam can offer an Islam 101 class followed a Q&A session.